From next year, 300,000 children across Australia will have access to live music as part of an initiative by Musica Viva, Australia's oldest independent professional performing arts organisation. Each of Musica Viva’s shows come with a term’s worth of classroom materials and accredited professional development, all tailored to the K-8 age range and designed to enrich music teaching for specialists and teachers. As part of the organisation’s 2018 launch, fifteen diverse groups will tour with programs ranging from classic rhythm and blues to Japanese drumming. Musica Viva’s three new shows, Water, Water, Everywhere, Vinci’s Apprentice and Wyniss, a dynamic group from Müa Island in the Torres Strait, will tour in Victoria and NSW. 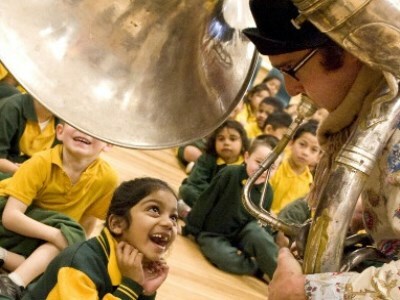 Michael Sollis, Musica Viva’s Artistic Director of Education, told The Educator that the organisation’s 2018 program spans the globe and “harnesses proven educational benefits on its quest to bring live music to every Australian child”. “Music education is inherently about creativity and discovery, which is primarily driven by inspiration and passion,” Sollis said. However, Solis said that this is just one half of the equation. “We also create resources that not only provide students with lesson plans to best explore and discover the music they will experience, but also give teachers of all backgrounds the confidence to facilitate music in the classroom, nurturing the creativity of students across the country,” he said. Research has shown that in addition to improving students’ self-confidence and team work, music can help students progress in crucial learning areas such as English, Science and Maths. Indeed, countries that place a strong focus on music education tend to have better outcomes in literacy and numeracy as speech and music have a number of shared processing systems. Sollis says music is “fundamental” to society and that Musica Viva’s three new shows in 2018 illustrate how music “affords a unique means to understand the world around us”. “Wyniss from the Torres Strait Islands have put together a program that explores how games we learn as children teach us about our culture and respecting our heritage, whilst Water Water Everywhere is all about the effect we have on water and the effect it has on us,” he said.